Quick and easy frozen yogurt bark recipe, made with simple ingredients. 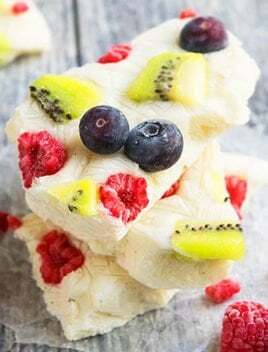 This is a creamy, healthy dessert or snack that's loaded with fruits (blueberries, raspberries, kiwis), chocolate chips and nuts. In a mixing bowl, add yogurt, honey, protein powder and mix until everything is combined smoothly. Line a cookie tray with wax paper and spread this yogurt mixture into a 1/2 inch thickness. Sprinkle raspberries, blueberries and kiwis on top. Remove from freezer and use a sharp knife to break the bark into random pieces. Enjoy. Sprinkle chocolate chips, nuts, coconut on top. Leftovers can be stored in a sealed Ziploc bag in the freezer for up to 2 weeks.